Welcome to happy jack cats! ​This site is for those of you who are full-fledged, card-carrying, crazy cat people; those who are one cat short of crazy; those who have learned that cats are like potato chips, so you can't have just one; and the poor lost souls who don't have a cat. To give every healthy kitten a chance to live, grow, and thrive in a forever home. Happy Jack Cats, Inc., is an Idaho Non-Profit Corporation (EIN # 47-54558-5) and 501(c)(3). We are a limited admission, foster-based rescue and adoption group based in Meridian, ID. We couldn't be prouder of our relationship with The Petco Foundation, and Happy Jack Cats, Inc. can never thank them enough for their support of our organization! We have received grants from The Petco Foundation in 2016, 2017, and 2018. Thanks again to The Petco Foundation! Thank you to our website sponsors! Our Mascot, Jack, is as real as can be. Hercules, the little black kitten, works his magic and finds himself a home. Alley Cats Bowling Fun Day! Shop with Amazon Smile and a donation will be made to Happy Jack Cats. Order pet food at Chewy and they'll donate $20 to our cause! Happy Jack Cats, Inc., is a proud recipient of funding from the Petco Foundation in 2016, 2017, 2018, and 2019.
in 2016, 2017 & 2018. I'm cleaning out my file cabinet and found my file for Lucy, the kitty in my [Facebook] profile photo. Ex husband got Lucy for my daughter from the humane society for free back in 1995 with a $25 coupon toward her spay surgery. Lucy's spay, vaccines, disease tests, and deworming cost me $381 back in 1995. 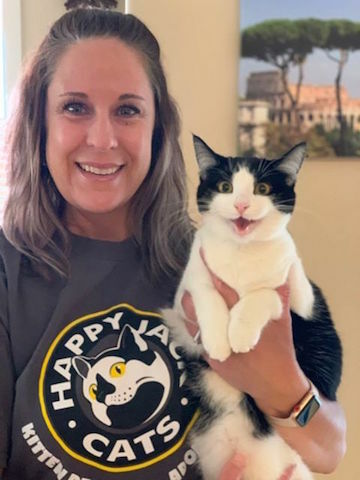 Thank you to Happy Jack Cats, and all of the other adoption agencies for making it affordable to acquire a healthy kitty! Thanks for always being a safe place for kitties to return to! I sure hope these two [Joy & Cloe] find a new FOREVER home right away!